We spent the last few days exploring Pure Michigan! Michigan has a lot to offer the every day adventurer like us – fishing, hiking, camping, and more. We were only visiting for a few days, and were not able to experience everything Michigan can offer, but boy – we saw some great sights. We have added Northern Michigan to a place we would like to visit again. We left the Jeuck Family Cottage on Saturday morning and drove to Pictured Rocks National Lakeshore, in Northern Michigan. This was our first experience at a National Lakeshore, and were impressed that it was much more than just that. They offer dozens of hiking trails, waterfall views, and nearby camping. We hadn’t realized that the drive from Wisconsin to Michigan put us into Eastern Time zone, so we lost an hour. Pictured Rocks National Lakeshore is America’s first National Lakeshore, designated in 1966. 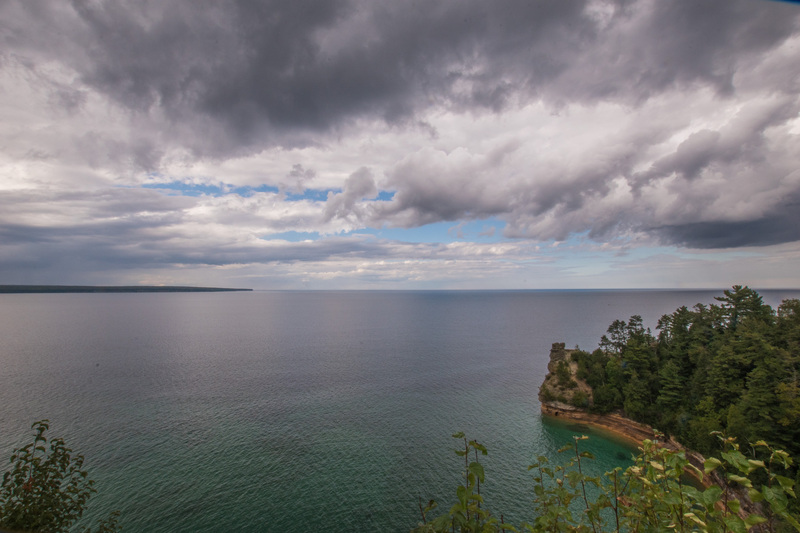 The National Lakeshore runs 40 miles of Lake Superior’s lakeshore, with the “Pictured Rocks” running 6 miles. So what are the Pictured Rocks? They are Sandstone Cliffs layered in shades of brown; green and white, making them look so… “Picturesque”. Pictured Rocks formed thousands of years ago. This area of Michigan had massive glaciers inching back and forth for a million years, scouring and molding, while the land took on a new shape. The glaciers moved, enlarged river valleys into wide basins that would eventually become the Great Lakes. The last glacier in this area was 10,000 years ago. Once the glacier started to melt, the land rose and exposed bedrock to lake erosion. Today, the water pounds and sculpts the cliffs. We ended up having a late lunch picnic at the Miners Castle. 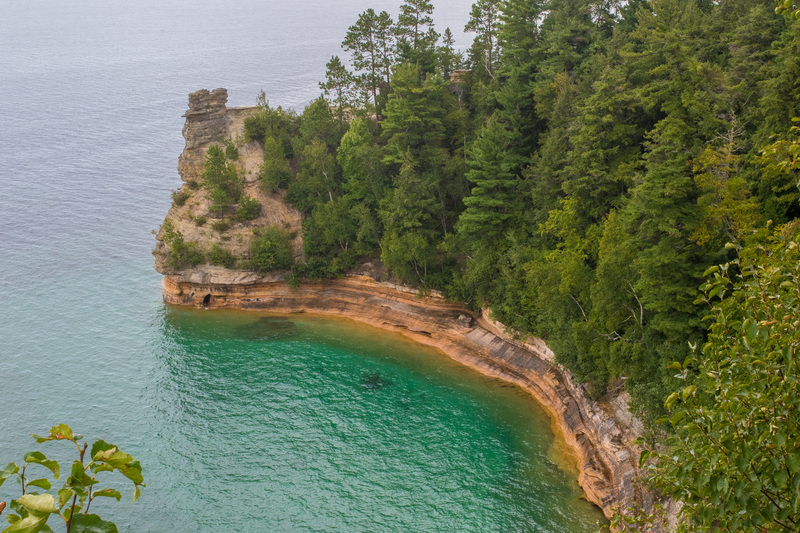 Miners Castle is a beautiful formation of the rocks, and gave us a view below at the shoreline. We had the intention of visiting all the overlooks and taking the hike to the beach with Sparky, but Mother Nature had different plans. Shortly after lunch we were caught in a downpour. We made the best of it at the overlooks, and were able to get a few pictures, but decided to end Sparky’s misery and headed back to the car before we could start our hike. 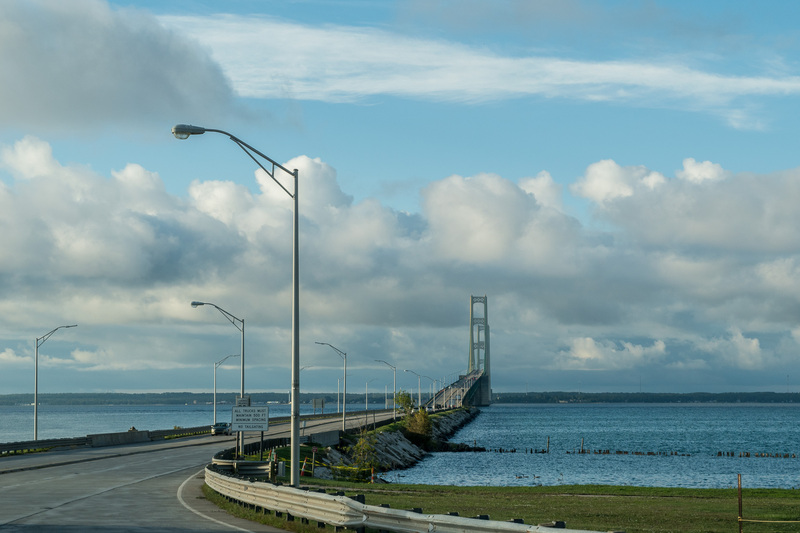 We continued our drive through Northern Michigan towards our campground in St. Ignace. We were “treated” to more rain showers during our drive. The rain was pounding hard on our windshield; even Sparky woke from his nap to figure out what was going on. Once he concluded it was rain and not a threat, he was lulled back to sleep. I was just happy that Steve was driving and I wasn’t. We arrived at St. Ignace KOA at 6:00pm, using the time to empty our tanks, do laundry, watch TV, cook dinner, and relax. On an unrelated side note, Steve and I totally got sucked into several episodes of a 48 Hours marathon, which led to an exciting night of debating evidence, people’s innocence, but not productive to our blog – our apologies. Just watch one episode – you will get hooked. Sunday morning we set out to view the famous Mackinac Bridge. It was a sight! It is similar to the Golden Gate Bridge – just a lot bigger, and silver color. 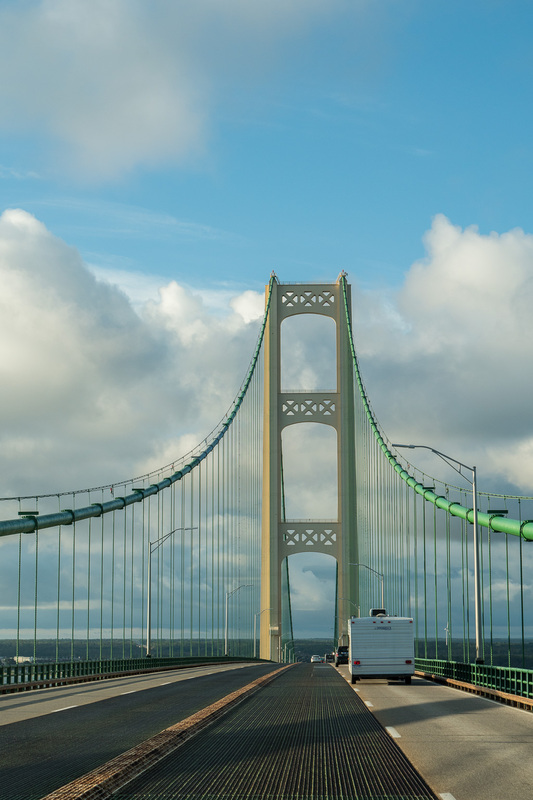 According to their website, the Mackinac Bridge (Mighty Mac) is the 5th longest bridge in world, although Wikipedia claims 17th. Whatever it is, it is an engineering marvel. I was bummed that they don’t allow walkers on the bridge, except one day a year for their annual “Bridge Walk”. I would’ve loved to take in the views as a pedestrian. 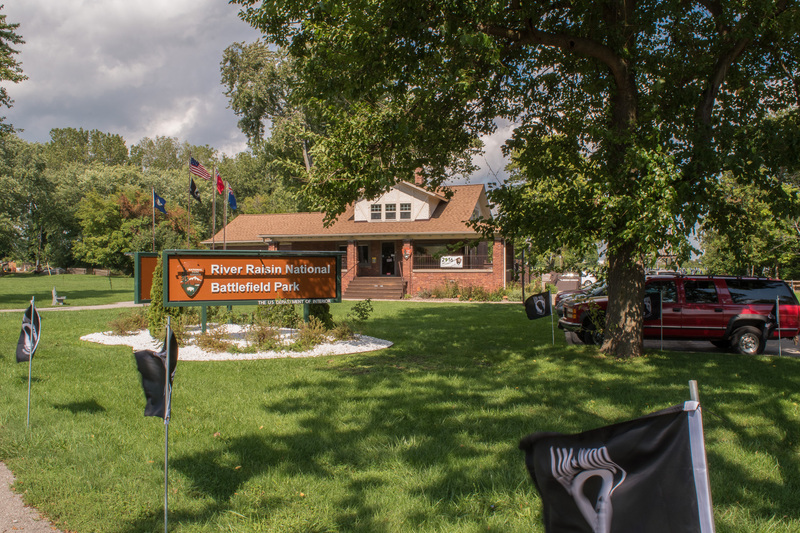 We also visited the River Raisin National Battlefield Park, in Monroe, Michigan. “Remember the Raisin!” – sound familiar from history class? 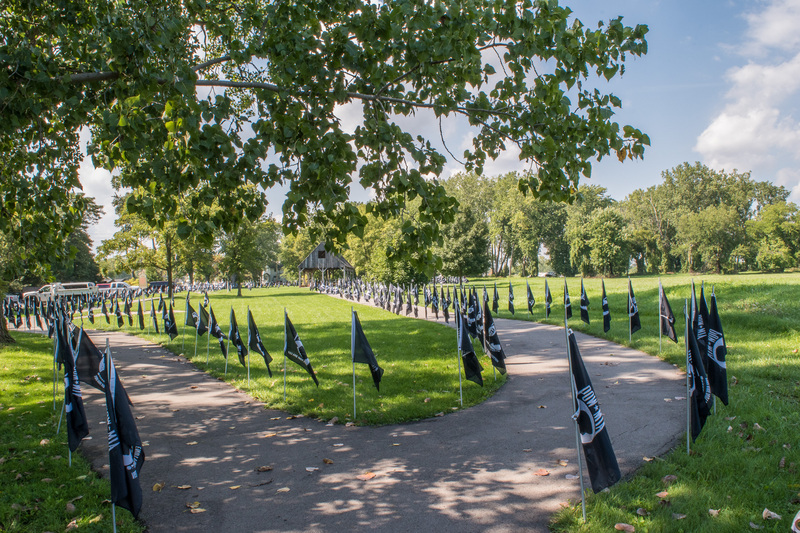 What makes this battlefield famous is not the two battles, but what happened the day after the second battle. If you might remember, during the War of 1812, en-route to recover Detroit, American troops instead went to Frenchtown (now modern day Monroe, on the Raisin River) to aid a group of American troops in holding off the nearby British Army. The first battle, January 18, 1813 was a victory for the American troops. The British and their Native American allies returned on January 22 just before dawn and attacked. The American troops were surprised, and defeated. The British took 500 prisoners and while advancing left them in the care of six officers. The next day, January 23, after the six officers left, a group of Native Americans arrived killing and scalping the American prisoners. They killed between 30-60 already wounded American soldiers. From this point on, the war only got more ugly and bloody – peace didn’t come for a few years, in 1815. Steve and I enjoyed looking at the museum, and walking along the trails. The trails had information posts and quotes from soldiers who witnessed it all. I have mentioned it before, but Steve and I like battlefields and the history that comes along with it. Steve and I enjoyed Northern Michigan; it is probably much more our pace than the big cities in Michigan. We drove by Detroit and saw the famous 8 Mile Road. As thrilling as that was, life on the shores of a lake and all the trails are more of our speed. 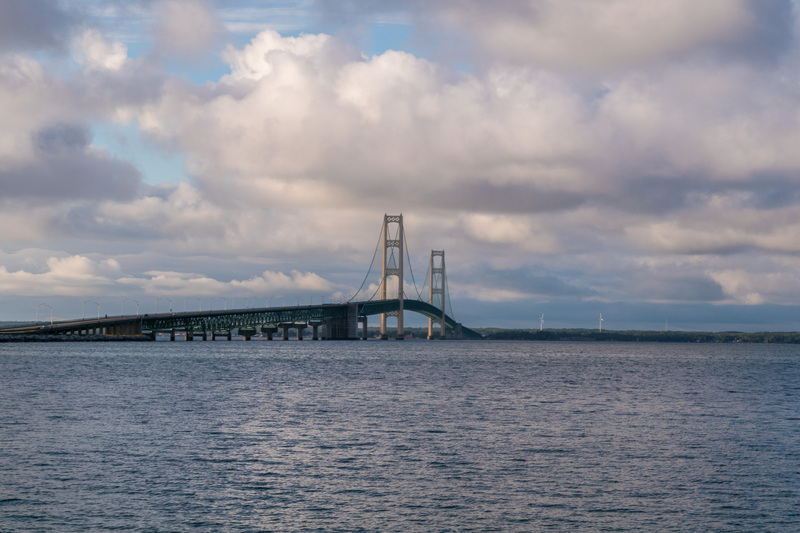 We would want to spend more time along the Mackinac strait, and perhaps visit Mackinac Island. We want to explore Lake Superior as well. 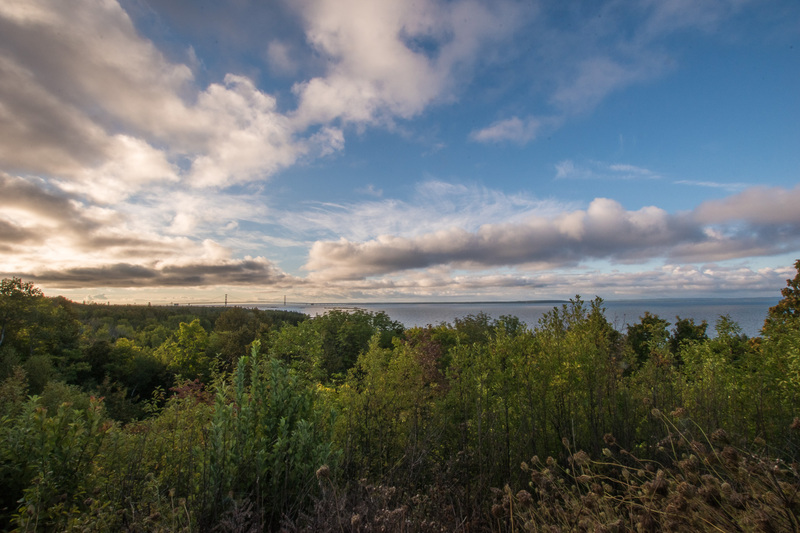 There is another National Lakeshore – the Apostle Islands National Lakeshore, and Keweenaw National Historic Park we would like to check out. We made it to Ohio and will be here for five days! Stay tuned! I’m loving your blog. I just binge read it, I hadn’t read anything since Seattle. I know its hard work but keep it coming. It feels like I’m there. I miss Sparky! Thanks Ana!!!! I am so glad you enjoy it! I hope you are doing well! Sparky misses all of his friends at work, especially you! Xoxo!